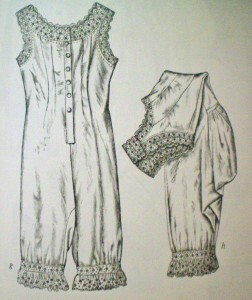 Victorian combinations are a one-piece garment that combines a chemise and drawers into a streamlined sort of romper. It’s the first undergarment you put on and thus provides a barrier between your corset and skin, protecting your corset—which often cannot be washed—from your body’s oils and perspiration. It has a fitted upper body and a loose lower body. The crotch is split, which makes using the restroom much, much easier. Don’t worry: the edges of the crotch overlap, providing modesty and preventing drafts. 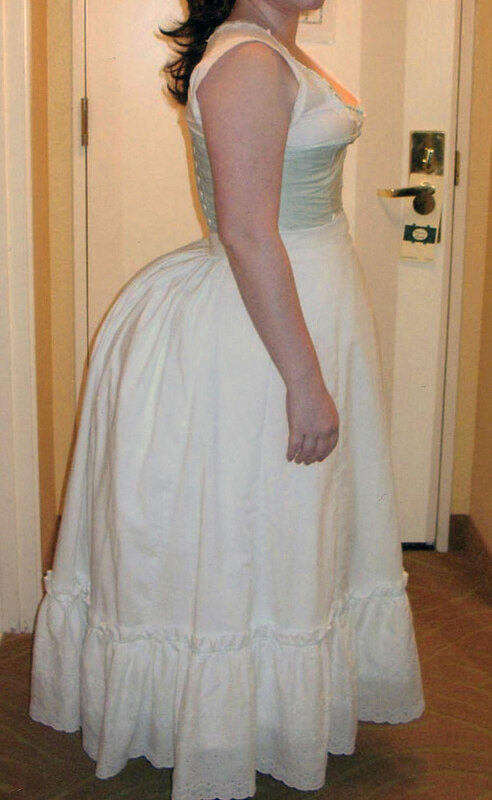 When I made my first Victorian costume, a replica of Christine’s “Wishing” gown from Andrew Lloyd Webber’s musical, The Phantom of the Opera, I realized that I would need a complete set of undergarments, including combinations, a corset, multiple petticoats, and a bustle. 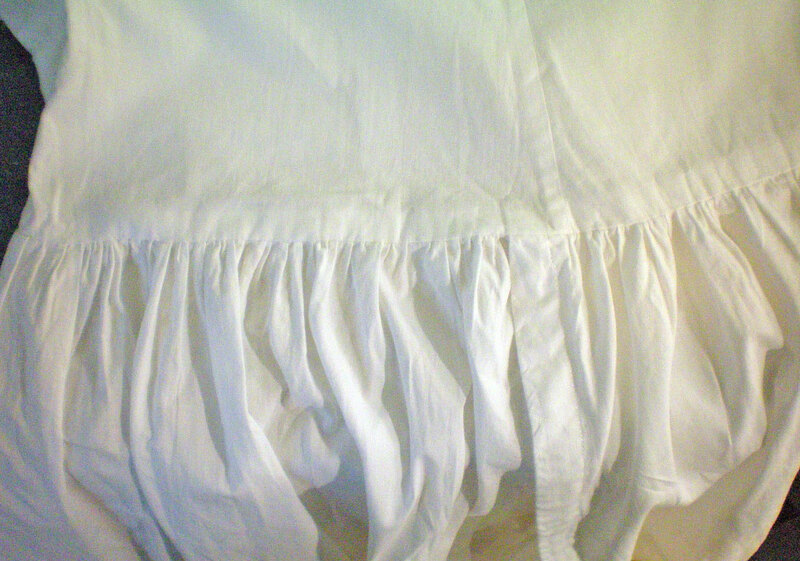 I went to Hancock Fabrics and bought several yards of a fine, white muslin and used it to make a matched petticoat and combination for daytime use. 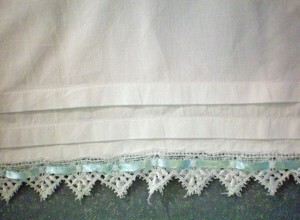 I trimmed both the combinations and corset with a white Venetian lace that I threaded with aqua ribbon. I added pale aqua buttons to the combinations, which, with the ribbon, provided a hint of color and lent continuity to the garments. When I began planning my ballgown, I realized that I would need new combinations to be worn under it, as my first combinations had a high, square neckline, suitable only for wearing with a day dress. The ballgown would be nearly off the shoulder, and as such, would need combinations with a wide, low neckline. 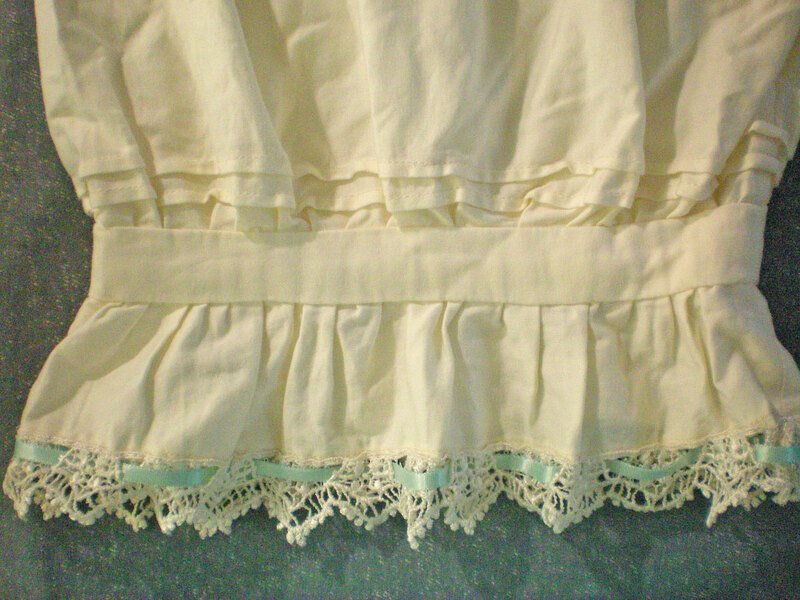 I had several yards of an ivory cotton sateen, which I decided to use for the combinations and the matching trained petticoat. 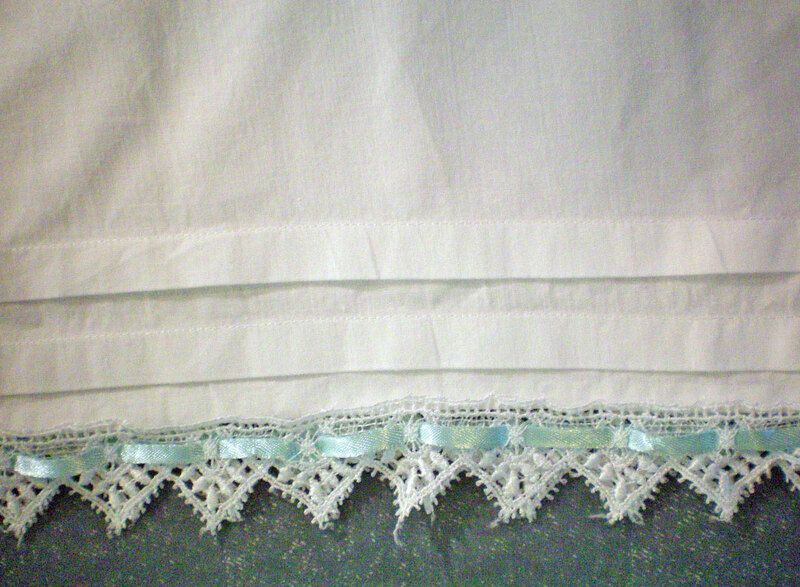 For trim, I used a beige Venetian lace and the same aqua ribbon I used for the first set of undergarments. Truly Victorian’s combinations go together quite easily. It’s comprised of two front pieces, two back pieces, a facing, the sleeves, and the leg cuffs. You add darts to the front pieces, sew the fronts to the backs, then create a facing that goes from the center front neckline to the open crotch. 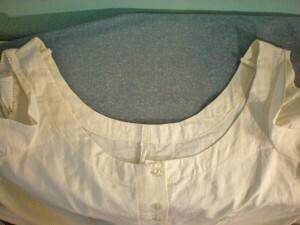 Once the garment is faced, you gather or pleat the lower back panel and fit it to the upper back. This creates a nice, baggy rear, which helps provide coverage. Gathering is looser and therefore easier to wear, but pleating looks nicer—so it depends on what you’re comfortable with. As for the legs, you can choose to gather them into a cuff or leave them straight, like trousers. With the first combinations I made, I left the legs straight, with the addition of two rows of decorative tucks. I tried gathering the legs into cuffs, but found that the back of the leg cut into my thigh when I sat. I believe the problem stemmed from the fact that I had pleated the material of the lower back instead of gathering it, since when I gathered the back of the second combination, the cuffs fit comfortably. Therefore, while my first combination had straight legs, the second one is gathered into narrow cuffs. 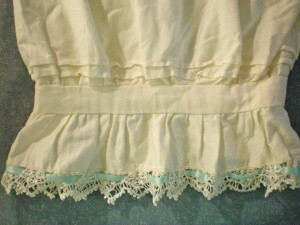 I added a ruffle below the cuff and edged it with Venetian lace. Next you add the sleeves, which are essentially cap sleeves: crescent-shaped and gathered. Unlike traditional sleeves, however, the gathered part goes on the bottom of the armscye. The top is narrow and overlaps at the top of the shoulder. You put the wide, gathered part on the bottom so that it covers your armpit and helps protect your dress from perspiration stains. Quite smart, really! Finally, you place buttons down the front. 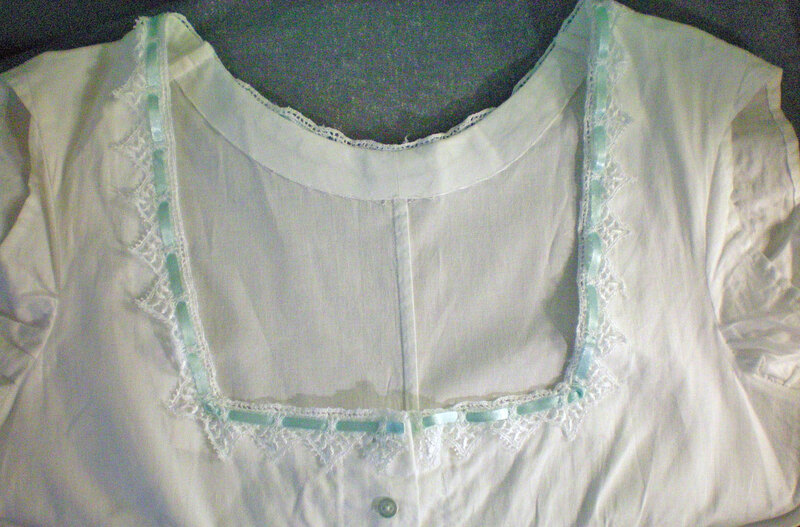 I hand stitched the buttonholes and sewed on small buttons: pale aqua for the first garment and ivory for the second. 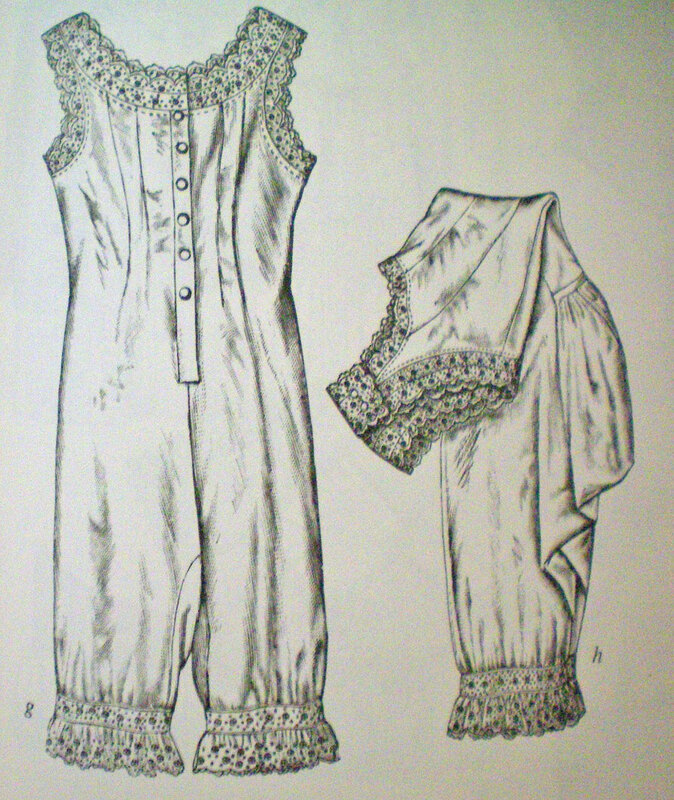 I added a collar of Venetian lace around the neckline of the first combinations, but decided to leave the second one plain. 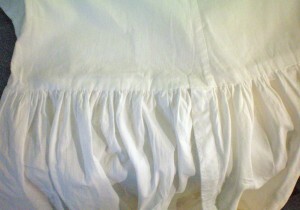 I used French seams, except for the center back seam of the ivory combination. I left that pinked and raw because I had to let the center back out at one point and there wasn’t enough seam allowance left to finish it nicely. I had to let the back seam out because the armsyces cut into the front of my armpits. I have this problem frequently, but forgot to make my normal adjustment for it. Letting the center back seam out was a make-do fix, but to my dismay, it didn’t solve the problem. 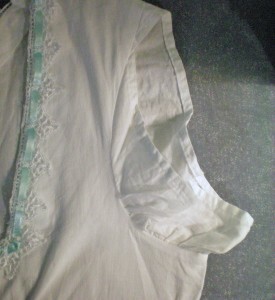 As it turns out, the problem vanished when I shoved the sleeves up onto my shoulders, so it stems, somehow, from the fact that the combination is cut off the shoulder. Unfortunately, it’s designed to be worn with an off-the-shoulder ballgown and therefore nothing can be done about it. I don’t imagine I’ll have much occasion to wear an 1876 ballgown, so I have hopes that I’ll simply be able to put up with the discomfort for the short amount of time that I’ll be wearing the costume. I now have two combinations, one for daytime and one for evening. I would like to make a third, someday, using the fitting techniques I’ve learned since making both of these, to see if I can improve the fit of the armscyes. Until then, however, these will do just fine.